Craving for something deliciously sweet? 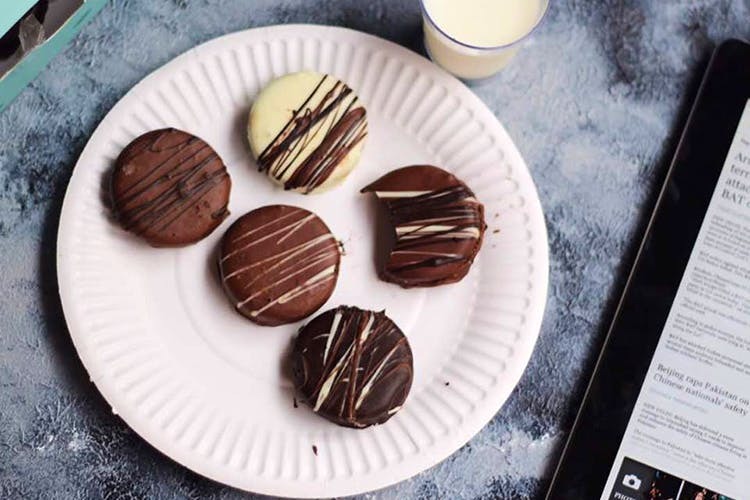 Bite into a variety of chocolate-dipped oreos delivered by OCD – Oreo Compulsive Disorder in Shenoy Nagar. Looking for a dessert gift box for bae or a bestie? Or how about just treating yourself to some sweet chocolatey goodies? OCD – Oreo Compulsive Disorder in Shenoy Nagar is slam dunkin’ our favourite crème sandwich in all kinds of chocolate and making it even more irresistible. The idea is pretty simple. Dip an Oreo in melted chocolate (yum) and then refrigerate. Using different kinds of chocolate to dunk these biscuits in, you can now get a box of nine assorted flavours of Oreos. There’s the aptly titled Assorted Box with a combo of white, dark and milk chocolate covering Oreos with strawberry, chocolate or vanilla fillings. Then there’s a Snow White Box for lovers of white chocolate and The Sinfully Dark Box for a richer, darker indulgence.